There is no better way to bring in more versatility and increase your productivity than getting the best tablet for business. If that’s exactly what you’re looking for, make sure to read further because you’re in the right place. 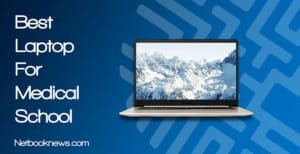 Even though there are many tablet models available, there are some very serious tablets that are made to easily replace a laptop, and offer a better work environment for a business, no matter the industry. We’ve done our in-depth research and spent many hours finding a tablet that isn’t only performing well but come with various features that will benefit any business owner. Therefore, you can only expect to get honest feedback and reviews. In this article, find top 8 business tablets that can help you take your productivity to the next level, and never have to worry about tech reliability ever again. 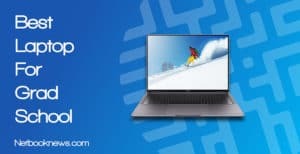 If you’re used to Windows OS and you’re looking to get the best Windows tablet that will serve your business well, there’s no better choice than Microsoft Surface Pro 6. 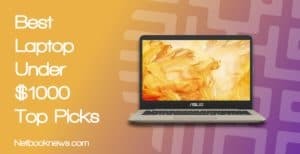 It’s a brilliant laptop which is very powerful, yet sleek in design and can be used in 3 different modes. 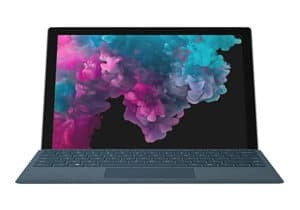 Microsoft Surface Pro 6 is a very thin and lightweight laptop that increases its compatibility, making it one of the most versatile tablets. 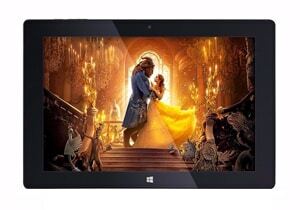 What is so special about this tablet is that it can be used in 3 different modes – as a tablet, as a laptop when the keyboard is attached, and as a studio mode which is suitable for watching movies, entertainment or even for work presentations. 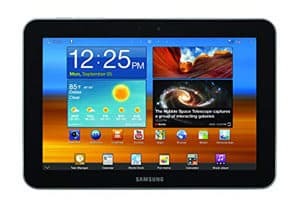 Therefore, this is the best tablet for business owners who require to stay versatile most of the times. Not only this tablet will endure the heaviest tasks during your business hours, but it will last all day without ever having to charge it in your office. On a single charge, Microsoft Surface Pro 6 can last up to 13.5 hours of regular use. If you’re not regularly using the tablet during work hours, you’ll sometimes even get through 2 days before having to put it on a charger. This is very useful for businesses who regularly take their work on a go, or between the departments. Microsoft Surface Pro 6 is equipped with one of the latest configurations that give even more power than any previous Surface tablet, thanks to the 8th generation Intel i5 processor. Along with such a powerful processor, there is 8 GB of RAM and 128 GB of storage. That’s more than enough to keep your business tasks under control at all times. 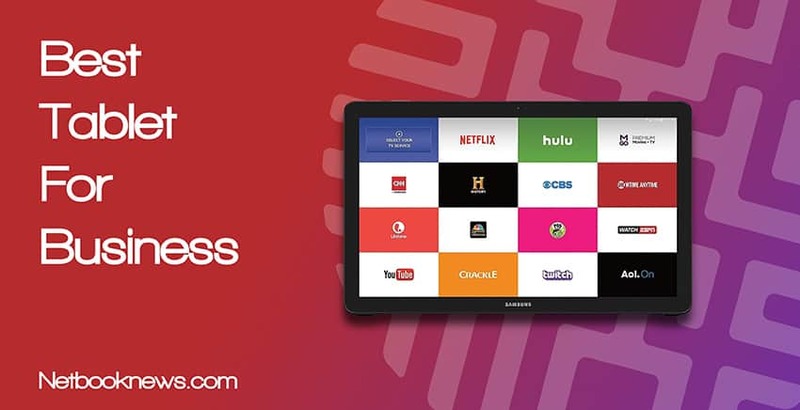 When you’re looking for a business tablet that is affordable yet can handle all your operations, Fusion5 Tablet deserves the chance. It offers an ultra-slim, stylish, and portable experience that is powered with a decent configuration to offer reliable service. This ultra slim and ultra stylish tablet offers a decent configuration that runs excellent Windows experience. The Fusion5 tablet is loaded with a Windows operating system that which makes this tablet perfect for office work, education, and even industrial use, among others. With the ability of Microsoft Office, this is the best tablet for realtors who could use advantage of Powerpoint presentations. This tablet is powered by a quad-core Intel processor and has 4 GB of RAM in combination with 64 GB of storage space which is expandable. It’s a perfect combination which works in a way to provide best results that won’t only make sure you’re up to speed with the latest tasks, but that you have a reliable solution which won’t slow you down or keep you sitting at the table. Fusion5 is a tablet that is very slim, even though it features very decent components. There’s even USB 3.0 port to allow you a high level of connectivity. The display on this tablet is a 10″ graphic display which is made to provide the optimal viewing experience. No matter what you’re watching, from work, excel tables, to entertainment, Netflix, movies, Youtube videos, or even playing games – it’s easy to say you won’t be disappointed by the view. It’s important to take care of your eyes during long working days, and this display does exactly that. If you’re looking for the best tablet that will serve well for a small business, look no further. Samsung Galaxy Tab A is a great tablet with a powerful processor that has a decent screen size, long battery life, and is full of helpful Samsung features. Samsung Galaxy Tab A features a vibrant display that can reach high resolutions of up to 1920 x 1200 pixels. The image is really crisp thanks to the brilliant backlighting. And no matter what you’re looking at – your digital media will be shown in a vivid fashion. Lifelike details will make sure you never miss anything. The battery can last up to an amazing 13 hours on a single charge, which is perfect for people who are busy enough with work to be slowed down by a charger. 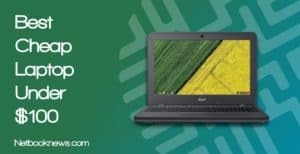 On the other hand, the octa-core processor offers nothing but efficiency through the responsive performance that will allow you to keep up with any work tasks. Multitasking between different apps is very easy thanks to the smooth and accurate performance. Even though Samsung Galaxy Tab A only features 16 GB of in-built storage, there’s nothing to worry about. One of many useful features is the expandable memory that lets you upgrade the tablet and expand its storage up to 200 GB with micro SD card. However, keep in mind that apps can only be installed on in-built storage, while external memory is made so you can store photos, videos, music, and other personal files. For successful businessmen, there is no better tablet than the latest iPad Pro. It offers the best reliability ever, in combination with a powerful performance and a very smooth OS. Combined with long lasting battery life and a lightweight design, you’ll be running your business from anywhere. The newest iPad Pro has the most innovative screen which has a few features combined together, giving an excellent view on anything digital. iPad Pro features an all-screen that goes from edge to edge and a Retina display that is improved with a Liquid technology. The front of the tablet is all screen, making sure you never miss any important detail. 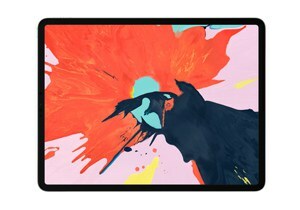 Apple has completely redesigned the iPad Pro, making you re-think what is actually iPad Pro capable of. Not only the screen got drastically improved, yet the performance is taken to another level with the help of A12x Bionic chip which is one of the smartest and the most powerful Apple chips ever produced. Security is also taken very seriously and it’s improved with the latest set of updates to improve efficiency along with reliability. If you find yourself constantly multitasking, iPad Pro will allow you to do it with just a few swipes across the screen. You get the chance to work on creative projects, message friends, FaceTime business associates, and even do a search on the web – all at the same time! If you take advantage of an Apple Pencil that is available to be purchased separately, you will experience the most efficient multitasking on a tablet ever. 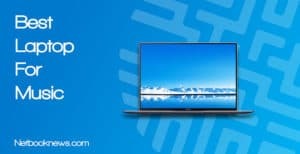 When you’re looking for a tablet that can easily replace your computer monitor, yet offers a very versatile multitasking ability – Samsung Galaxy View is the ideal choice, hence the name. It’s offering an amazing view with a crisp, bright, and large screen, while it’s equipped with a configuration to offers nothing but best performance. 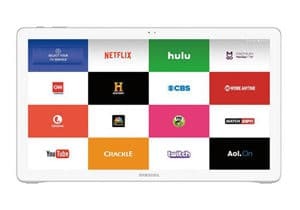 Samsung Galaxy View is one of the rare tablets that come with an LCD screen of a very large (18.4″ inches) size. It’s a lot bigger than other tablets, and it’s even bigger than most laptops. It’s a TFT type screen and therefore, the resolution isn’t the best (1920 x 1200 pixels), but it’s decent and satisfying. Due to its big screen, this is the best tablet for office. Even though this tablet features an extra large display, it’s keeping its thin and sleek design that offers nothing but the best versatility. This tablet is very easy to carry, however, we find it a bit hard to use for people with small hands. Therefore, a sturdy stand is very helpful in resolving the issue. Working on your business on a go has never been easier with such a great view. Samsung Galaxy View comes with a great and sturdy stand that can be used in a number of different positions. You can set the tablet on your table and the stand will keep it stable, giving you the freedom to do your work easily. You can even lay the tablet on a table and it’ll still offer a slight angle for the easier view, making sure you never experience neck pain. If you’re looking for the most versatile tablet that will give you 3 in 1 ability, Lenovo Yoga Book is the right choice. It is equipped with a very powerful performance, includes Stylus pen, and has a very versatile and slim rotatable design. Considering the price, it’s very worth the value. Stylus pen with real ink comes included with Lenovo Yoga Book. It’s offering the ability to take advantage of the tablet’s design and take writing to another level. If you’re looking for a tablet that is made for taking notes, among taking care of other business-related tasks – this is the perfect tablet that will do the job. 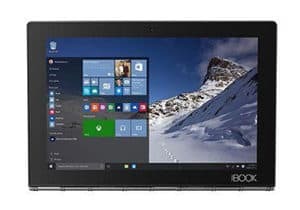 Lenovo Yoga Book features a very versatile design that can rotate 360-degrees, offering at least 4 positions to use the tablet in, to get the most out of it. You can use this tablet to take notes, draw, browse, watch, or type. Whatever it is you’re looking forward to taking care of, your business will be more productive than ever before. Such rotatable display makes this to be the best tablet for stock trading due to its versatility. This tablet is equipped with some of the first-class components that take the efficiency and capability to the next level. Along very crispy IPS display, the tablet is powered with a quad-core x5-Z8550 processor that can be turbo boosted up to 2.4GHz, 4 GB of RAM, and 64 GB of storage. The Intel HD Graphics 400 isn’t the best out there, but it is decent and does its job for the purpose of this tablet. When you’re looking for the most rugged tablet that can help you do your business under rough conditions and mostly outdoors – Tab Active 2 is the toughest tablet for the job. It’s IP68-certified, and even though it’s not the fastest tablet out there, its offers decent performance for business on a go. 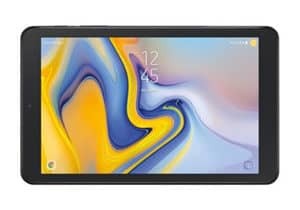 Galaxy TAb Active2 is a tablet that has been tested for drops, vibration, rain, dust, sand, altitude, and many other conditions. It’s IP-68 certified which means it’s water-resistant, dust-resistant, shockproof, and much more. It’s a tablet that can’t be destroyed easily, making it a perfect tablet for taking care of business in construction or other tough condition industries. Needless to say, this is the best tablet for construction workers and business owners. Even when this tablet is submerged in water, it is fully functional thanks to the enhanced touch. It’s perfect for a number of weather conditions. It even features a Glow mode where you can use this tablet in cold weather conditions with your glow on, without a problem. To keep your work secure on a go, Galaxy Tab Active2 comes with a biometric authentication that combines both fingerprint and facial recognition to allow users to keep their most important information safe at all times. Even when you’re using gloves or find yourself under tough weather conditions, you can always unlock the tablet in no time with the help of facial recognition. 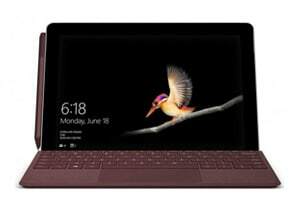 Microsoft Surface Go is a very versatile tablet that offers a detachable keyboard which has to be purchased separately, but it makes it one of the best tablets for writer to type out there. It’s not extremely powerful, but it features decent configuration with a point on its sleek and stylish lightweight design. Surface Go features 10″ PixelSense display that is designed in a way that no matter the viewing or touching angle, you’ll always get the best performance. Even writing under any angle is registered precisely, which is quite important for such a tablet. Whatever your business tasks are, and no matter how heavy they are on the battery, you’ll always be able to get a good 9 hours of power. This is perfect for people who are looking for straight 8-9 hours of work. If you’re a regular user, a single battery charge will last you all day. Even though the Microsoft Type Cover has to be purchased separately, it’s one of the most comfortable keyboards you could ever use for a tablet. It’s very sleek so it goes well with the tablet, doesn’t take a lot of space, and is perfect for taking care of business even when on a go. If you opt-in for the type cover, this would then be the one best tablet for lawyers and writers. Depending on a profession, size will vary. If you’re spending most days in your office and you plan to use external peripherals such as a keyboard and a mouse, you could ideally get a tablet that is on a large side. However, if you like to stay light, travel a lot, and do work outside the office – you’d definitely want a smaller tablet or at least a tablet that’s somewhere in the middle. This way, you can still do all your work, yet just in an easier manner. Your profession is most likely going to determine the form and design of your next tablet. You’ll have to determine whether you’ll need a rugged and durable tablet, or a lightweight and thin tablet can do the job. In order to be able to input and type information into your tablet no matter where you are at and how busy you are, you’ll want a keyboard that is as accurate as possible and that offers a decent size which will be comfortable to use. You’re most likely going to have a need to connect external devices such as a printer. Therefore, make sure to get a tablet that either has a universal port for easier connectivity or that it comes with a number of ports. Long battery life will get you far without ever having to keep you in one place. The longer battery life your tablet has, the fewer worries you will have during your business work hours.